In this presentation, Duncan Alexander, co-creator of the @OptaJoe Twitter account and author of the OptaJoe Yearbook, takes a data-led approach to examine and potentially debunk some of the major football stories and themes of the past few seasons. Firstly, he examines why Manchester United went from league champions under Sir Alex Ferguson in 2012-13 to a swift decline under his replacements David Moyes and then Louis van Gaal. The club are now on their third permanent new manager in three years, in the form of Jose Mourinho, and show few signs of reviving their former dominance of the league. While many have focused on the departure of Sir Alex Ferguson, Duncan focuses on those wearing the shirt. Secondly, Duncan will examine Leicester’s unlikely and era-defining Premier league title win in 2015-16. Nobody predicted the Foxes would win the league after narrowly avoiding relegation the season before, but what signs were there that such a sensational campaign was in the offing, and could it ever happen again? He will also look at the history of goalscoring in the Premier League era, and who can realistically be labelled as the competition’s greatest scorer, as well as the continued failure of England to achieve success at international tournaments, from heartbreak in the Euro 96 semi-finals to the abject displays in France twenty years later. James Fisk from Birkeck School of Business, Economics & Informatics reviews the event. Duncan Alexander has worked at Perform/Opta for a decade and has been instrumental in the rise of the use of data in the football media. Co-creator of the @OptaJoe Twitter account in 2009, Alexander is the author of The OptaJoe Yearbook 2016, released in August this year, and has written for and collaborated with organisations including The Guardian, the BBC, Sky Sports and The Mirror. Alexander, D. (2016). Optajoe’s Football Yearbook 2016: That thing you thought? Think the opposite. Century. Duncan Alexander – Penguin author. tbrfootball.com (4th September 2016). 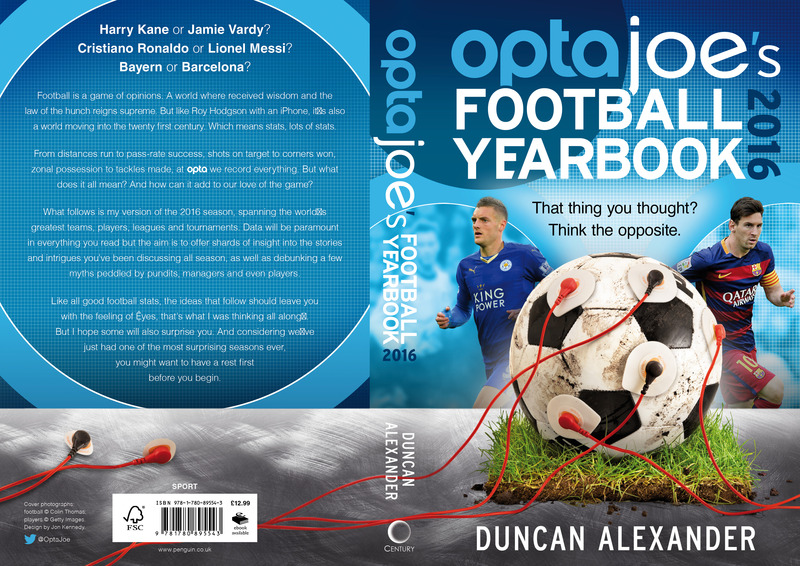 Exclusive Interview With Duncan Alexander, Author of Opta Joe’s Football Yearbook 2016.
the42.ie (30th October 2016). Heart rate monitors during penalty shootouts? – How data is changing the way we analyse football. the42.ie.